On living in the shadows. “It’s better to burn out than to fade away,” said Neil Young, quoted by Kurt Cobain. However, even fading away is exorbitantly costly. There comes a time when the debt has to be paid, even if one has only wandered through dull and soporific terrains where an imperceptible corruption eats away at even the most shriveled destinies. That is why life is so endlessly short, so long it seems it will never end but always too short with respect to what is possible. Some things you learn the hard way. Here’s one: don’t ever live in someone else’s shadow. You’ll wake up one day, maybe on the cusp of 28 years of age and realize you were living a life of pretence when you thought you were living a life. And even when you discover the nature of those shadows, sometimes people won’t let you happily untangle the binds. They might keep projecting this false self onto you, encasing you in that same sticky binding, only for you to painfully re-shed it over and over again. To live in the shadows is to feel robbed of something. You took my choices, my opportunities, you shaped what was possible. I am reduced only to the self other people make of me. Where lies my essence? Can we be so naive to think in such ways, to cling like Chomsky to the belief in the essential good of human beings, or else perceive the self as a Foucauldian chasm of disparity, each molecule determined by discourses out of reach. The self emerges only in resistance to the state of things. Wandering dull terrains is still a choice not just the aimlessness it appears. Non-action is decisive even if it is not active, and can be the better option when the avenues to express one’s desires are unsatisfactory, limiting and repetitive. To recognize who controls the ties that bind you, who manipulates the shadows in your cave, is one thing. But to formulate this into a new foundation on which to tread, is one other separate activity. And the ground keeps shifting. We are compelled to accept one reality as the norm of existence. This makes no sense to the chameleon soul that belongs to all and nothing at the same time. In Mysore people would remark “Oh but this is not real life.” Where is life then if not right in the present moment of experience? Life was back ‘home’. Life was a regular job, money worries, and saturday night TV. What happens when multiple realities exist on your horizon at one and the same time? Who are you? Each performance you give is never quite convincing enough, because you are always coming from elsewhere. The strangely composite personality. Home then lies in the acceptance of the chameleon nature of the self. Through the acknowledgement of the unstable nature of the self comes its own form of stability. The unresolved, incomplete feeling that haunts becomes a comfort in itself. The non-normative personality finds a normative rhythm in her irrationality. Narrative also weaves its own nest of security in the perfection of form. Here dreams are made tangible, love is made bearable and the unresolved is given order. The present moment always feels too bloated with false starts, and missed opportunities, non-action and the saying of wrong things. In writing, the chaos is glossed, captured and solidified to language; life is resold in endlessly new and shiny fashionings. A life is endured only to be written, and it is only then that it has been lived. Yoga is used as a means to build a space in the day-to-day busyness; fostering emptiness (a space of non-thought) within a day we consciously fill with activities that divert us from this same emptiness. Non-thought is programmed into the day consciously through prior thought. (Yoga retreats are the epitome of this scheduled relaxation. Similarly spas with their continual ‘just relax’ mantra have always created an unbearable degree of angst and anxiety in me. I could only ever enjoy a massage after the event, the obligatory call to ‘chill out’ feels oppressive and restrictive; I am performing a relaxed body rather than feeling as one). There appears a sad paradox here, as that which we turn for escape becomes its own form of mundanity. We are living for the days off, the holiday that suspends reality; we are always waiting for the right moment. In this form of existence we lose the opportunity to be alive to chance. Heading into the unknown is to make things happen; to recreate the grounds on which things can happen. And yet the constant desire for stimulating events is met with the equal fear of the materialization of these events. This central antagonism can stupefy us into non-action. Dreaming without action is a privileged position. So too here we find the yogis that continue to promote bad feeling, who segment their time of non-thought as a ritual that becomes a banal performative gesture. These gestures of action are vacant of intention but heavy with a frustrated will that emerges from the nexus of abundant resources and a limited vision of what is possible. To emerge out of the shadows might entail a constant process of un-binding. It will involve a daily vigilance, like brushing one’s teeth. New narratives of self will be born and die in the same day. So too a yoga practice done correctly brings a kaleidoscope of emotion in 90 minutes. Relaxation is not the aim, nor is happiness our object, else all that prevails is a obligatory culture of niceness, and nothing, not even niceness (or especially not) should be our talisman. Instead perhaps we can invest a little more in those emotions that surface in us that we sometimes call instinct. Emotions that we neglect to gloss with a rationality; that serve to interrupt our plans. These unruly emotions (anger, love, envy et.al) are seen as something that gets in the way. But how about if we treat them as openings, that show new paths to navigate. Living a life in the shadows can mean such emotions are incubated for fear of disruption. But irruptions are a delicious opportunity to claim what has been lost, gain the new, to stop waiting. It means being a troublemaker, causing discomfort, brushing people the wrong way, ruffling feathers, consistently producing failed performances. Only then under the weight of felt resistance can we begin to sketch out that transitory self and find novel avenues to express the un-ending and incomplete desires. I had thought I was leaving in order to return, but I had overlooked the important interlude of returning in order to leave. And returning in the full sense, a return to neutral, zero. In ashtanga yoga practice after each standing pose you return to samasthiti (basic standing pose or mountain pose), and samasthiti is the pose that opens and closes the practice. It is a way to come back full circle, and samasthiti throughout the practice acts as a continual return to centre, that calms and steadys in preparation for the next posture. I feel I am coming back to samasthiti, as the noise of the city has disappeared and I am separated from the crowds, the tube delays, and trivialities of work, steadying myself in preparation for what is next. But a return to samasthiti is not a return to an old self, to a place one has been before. It is a place of neutrality that allows for the progression of the rest of the practice. Even if desired, a return to a previous self is often a fruitless pilgrimage. Visiting the house of ones childhood, for example, never matches up to the house that lives in memories. The house appears as a fraud, a soulless building, empty and vacant, yet at the same time inhabited my new and strange people. It is these moments of return in which we realise that even against our will, our world and the world outside has changed and in turn, and perhaps reluctantly, so have we (for better or for worse). 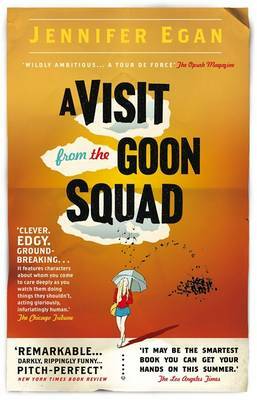 Jennifer Egan’s rather great novel A Visit from the Goon Squad captures the ambivalence of these changes we experience in growing up. Egan presents an array of characters, idiosyncratic and often conflicted, introduced subtly through the book’s chapters, that weave into one anothers lives. We see where characters begin and end, but not in order; in reverse and in intervals. Egan evokes Marcel Proust’s classic In search of Lost Time, and time merges and blurs as the characters make their way through life; some finding success, some failure, some both. I want to know what happened between A and B. A is when we were both in the band, chasing the same girl. B is now. What happens between A and B? It is not even merely a question of fortune or failure but a question more that asks, how is it one day we were there (young and hopeful) and next we are here (changed and old)? And even as we live through our own lives, and can provide the relevant details to present who/and how we are, (I did a degree, then I did another degree, then I was unemployed, then I didn’t get PhD funding three times in a row, then….) that space in between remains a mystery. And If my own life is a mystery how can I begin to understand how others I once considered my peers – strangers to me now – came to be married, have children, work in retail, or accelerate through the aging process so unfortunately. For some perhaps that event does not occur, even if it is anticipated. Others may resist, cling to what they know. And yet others find themselves actively burning the bridges that they had so conscientiously constructed. In this event it is not possible to go back so we must live on, forward, and onwards toward the elusive B. Yet what if we took a moment to pause in this space in between? Perhaps then we will not be asking like Scotty, what happened between A and B? Perhaps we will embrace the restless ambiguity and explore what being without a base – without A or B – can feel like. Perhaps then we can experience the new co-ordinates of this space-time, turning upside down everything which we have become accustomed to. In yoga, this can be experienced literally in Sirsasana (headstand), in which the alignment is the same as samasthiti, only it is your head which is on the ground and your feet in the air. The pose presents a new perspective on the world, a new perspective that can appear scary and disorientating. Everything is suddenly new – yet still familiar -but distorted. Sirsasana reveals the world does not have to be viewed in one way only, but is constantly evolving. As a direct opposite to samasthiti it shows that even as we return and everything we knew still remains the same (peoples attitudes, the town we grew up in) it is possible to find that through coming back to zero we (and the world we knew/know) can become new once again.